Remember last week on Tuesday when I was sick in bed? Well, I am presently sucking back a Bolthouse Farms Berry Boost Fruit Smoothie, which contains 500% of my daily vitamin C requirement, in the hopes that it will help me make it through the workday. (That Bolthouse Farms mention? I promise that that was completely unsolicited. I am just a Bolthouse Farms lover and like to give away free advertising while I figure out how to afford a decent computer and buy new glasses when the lenses alone are approximately $125 each. I am nice that way). I was a young man in college in the 1970s with a shaggy haircut who was told that he was failing out of school and then had the simultaneous realization that he was really a queer woman in the 1990s, which made him both transgendered and transchronological. I was in a foreign country at a restaurant that served me raw human flesh. I ate it, rationalizing my choice with the "when in Rome" proverb and the fact that the meat came from free-range, organic humans. The meat was surprisingly supple. An English man noticed an eagle hanging by its foot in midair. Oh, dear, he said, That bird's left side is completely obliterated, but its right side is still alive. What a horrible state. I looked up to see that the eagle was a siamese twin with a singular consciousness, and that it also had the heads of identical Englishmen, except that one of them was very corpsy and mangled. The Palinode has had to shake me awake a couple of times when I have cried out in my sleep over being forced into deathly tunnels or strangling baby koalas. Yeesh. The sleeping aspect of this cold is officially NOT WORKING OUT, which means that the being awake part of this cold is also officially NOT WORKING OUT. I cannot concentrate long enough to finish the pair of arm warmers I need finish for a customer or to work on the website design for another customer that I was going to finish this weekend or to put my freaking painkillers in my freaking purse because I HURT. From my head to my toes, I ache as though I have been on a forced march while dragging supplies through mud for three days; I am a serf at the feet of my viral lord. Every muscle in me is asking Why, why, why are we sitting up? We should be lying down! And resting! Even if it means we must dream of cuddling into the warm underbelly of a giant mother tarantula. 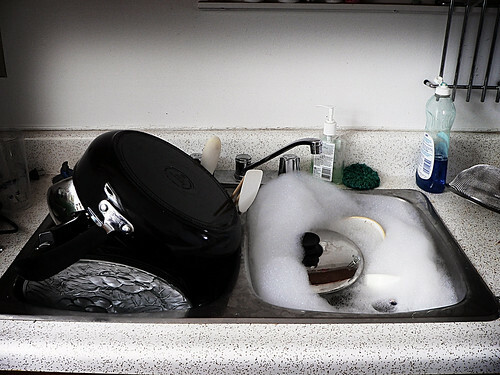 I was doing dishes. And then you know what? 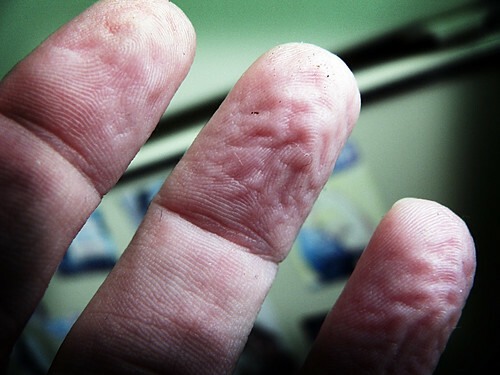 I got wrinkly fingers while I washed those dishes. My life is freaking genius. After work, I am going to the drugstore to pick up a cold remedy so that I can start hacking away at some of the projects on which I am working, but I am not sure which one will do the trick. Benylin 1 Cold & Flu gets me stoned (in a very nice way, mind you, but not one that is conducive to getting anything done, like figuring out what the first half of my sentence was so that I can say the second half without looking like I have gone catatonic), and I cannot take anything that has echinacea in it, because I am allergic to it. Any suggestions? This Schmutzie's got stuff to accomplish, and it is not going to happen without some fine pharmaceuticals.